Former Committees: University Graduate School Committee, University Graduate School Examinations Panel, School (CEIS) Research Committee, School Research Management Group, School Learning and Teaching Committee, School Ethics Committee. Part of submission of 14 FTE researchers in General Engineering, Northumbria University, December 2008, overall grade 3* (scale to 4*). Part of submission in Computing Science, Newcastle University, 2001, overall grade 5 (scale to 5*). Publications: by the end of 2014 237 papers had been published including 3 books/chapters, 35 refereed journal articles and 100 refereed conference proceedings. Information Systems: Modelling Complexity with Categories. Four lectures given by Nick Rossiter at Universidad de Las Palmas de Gran Canaria, 15th-19th May 2000, under the Socrates-Erasmus Programme. 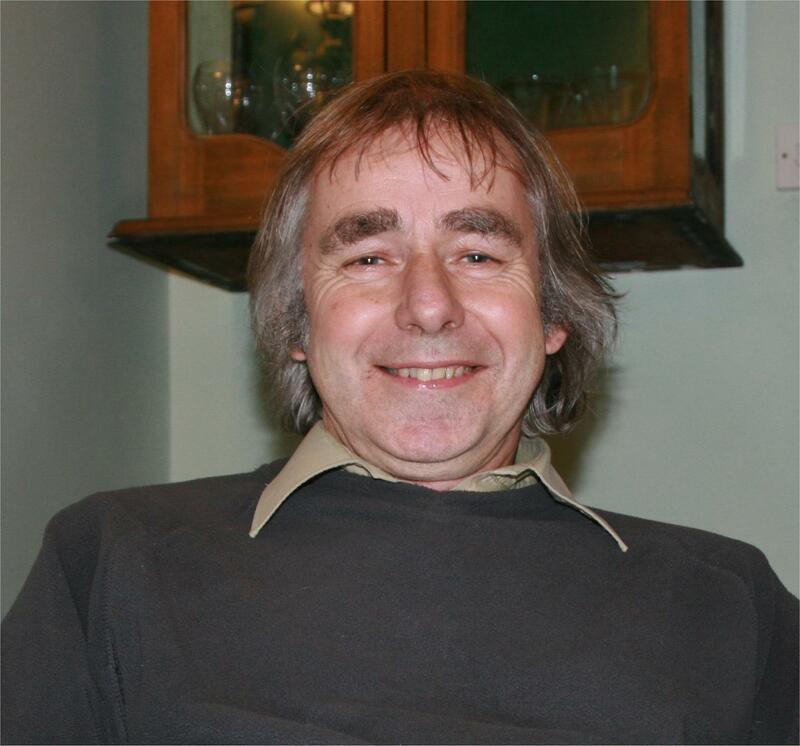 Rossiter, Nick, & Heather, Michael, The Universe as Intension: an Expressive Dynamic Information and Communication System as Extension, ANPA 39, St John's College, Rowlands Castle, Hampshire, UK, 13-17 August (2018). abstract pdf, presentation pdf. Heather, Michael, & Rossiter, Nick, Ensuring Software Quality in Information Systems, Studium Vilnense, ed. Romuald Brazis 26pp (2018) pdf. Rossiter, Nick, Music as a Composition of Cartesian Monad over a Topos, ANPA 38, St John's College, Rowlands Castle, Hampshire, UK, 7-11 August (2017). abstract pdf, presentation pdf. Rossiter, Nick, The Monad in Process-Relational Systems, 11th International Whitehead Conference, Ponta Delgada, Azores, Session: Whitehead, Mathematics and Logic (Vesselin Petrov), 25-28 July (2017). abstract pdf, conference abstracts, presentation pdf. Rossiter, Nick, Michael Heather & Michael Brockway, Monadic Design for Universal Systems, ANPA 37-38, Anton L. Vrba (ed. ), St John's College, Rowlands Castle, Hampshire, UK, 8-12 August 2016, Chiasmus, 369-399. (2018). presentation pdf paper pdf. Heather, Michael, & Rossiter, Nick, Formal Representation of Process & Reality in the Metaphysical Language of Category Theory: Whitehead's Relational Theory of Space, ANPA 37-38, Anton L. Vrba (ed. ), 217-254 (2018). paper pdf. Heather, Michael, & Rossiter, Nick, Universal Themes of the World as a Topos, GRAPH OPERADS LOGIC, AGMP X GOL Tallinn University of Technology 25-28 June 2013, AstrAlgo cWeb Vol. 2013 (1031) issue GOL X #1165, Eugen Paal and Zbigniew Oziewicz (edd. ), meeting communications (2013). abstract html. Invited speakers at meeting. Heather, Michael, & Rossiter, Nick, The formal arrow of physics. An introduction to applicable category theory, GRAPH OPERADS LOGIC, AGMP X GOL Tallinn University of Technology 25-28 June 2013, AstrAlgo cWeb Vol. 2013 (1031) issue GOL X #1190, Eugen Paal and Zbigniew Oziewicz (edd. ), meeting communications (2013). abstract html. Invited speakers at meeting. Sisiaridis, Dimitris, Heather, Michael, & Rossiter, Nick, The Contravariancy of Anticipatory Systems, Symposium 10, 8th BCSCMsG International Symposium on Computational Self-organised Emergence, organised Peter J Marcer, British Computer Society Cybernetics Machine specialist Group 10:7-10:8 (2011). This paper received the best paper award in Symposium 10. summary presentation ppt. Full paper published in IJCAS 27 181-202 (2014), ed. D M Dubois (see above). Sisiaridis, Dimitris, Rossiter, Nick, & Heather, Michael, Categorising Anticipatory Systems, Symposium 2, Applied Mathematics: Dynamical Systems, Logics and Category Theory 2:13-2:14 (2011). pdf ppt Heather, Michael, & Rossiter, Nick, Haecceity the Discrete Individuality of Process Physics, ANPA 32, Cambridge 5-7 August (2011). 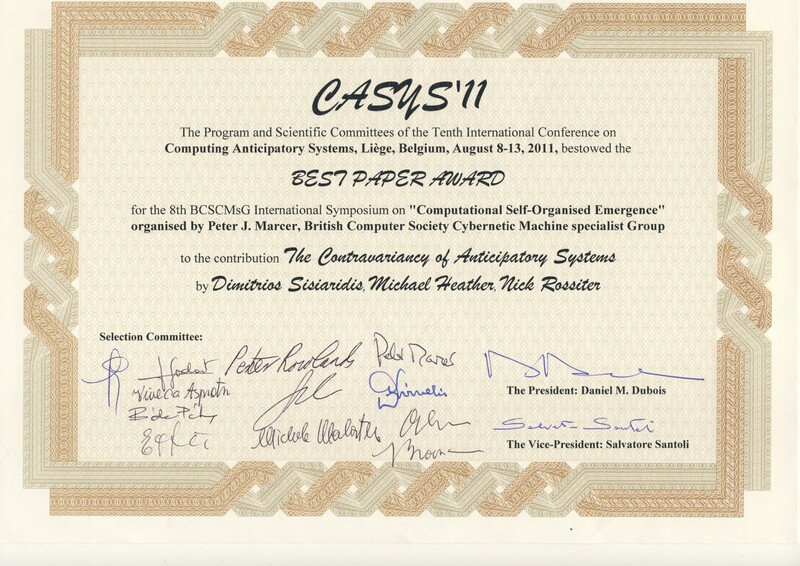 This paper received the Best Paper Award in the Symposium on Systems Science. Heather, Michael, & Rossiter, Nick, The Categorial Vacuum, ANPA 27, Cambridge University, 9-14 August (2005). Heather, Michael, & Rossiter, Nick, The Logic of Foundations and the Foundations of Logic, UNILOG 2005, 1st World Congress and School on Universal Logic, Montreux, Switzerland, 26 March – 1 April, p.69 in conference handbook or in printed form (2005). Rossiter, Nick, Heather, Michael, & Sisiardis, Dimitris, Typing of information systems: architecture and dynamics, GRAPH OPERADS LOGIC, AGMP X GOL Tallinn University of Technology 25-28 June 2013, AstrAlgo cWeb Vol. 2013 (1031) issue GOL X #1185, Eugen Paal and Zbigniew Oziewicz (edd. ), meeting communications (2013). abstract html presentation ppt pdf. Invited speakers at meeting. Also published as: Rossiter, B N, & Heather, M A, Handling Inconsistency with the Universal Reference Model, Advances in Modelling and Analysis, Best of MS’2000 Las Palmas AMSE 109-118 (2002). Maatuk, Abdelsalam, Ali, M Akhtar, Rossiter, Nick, Semantic Enrichment: The First Phase of Relational Database Migration, International Conference on Systems, Computing Sciences and Software Engineering, SCS2 08, 6pp (2008). Maatuk, Abdelsalam, Ali, Akhtar, & Rossiter, Nick, An Integrated Approach to Relational Database Migration, Proc Int Conf Information and Communication Technologies-2008 (IC-ICT '08) Pakistan, NWFP Bannu (ed.) 1-6 (2008). Maatuk, Abdelsalam, Ali, Akhtar, & Rossiter, Nick, Relational Database Migration: A Perspective, DEXA 2008, S S Bhowmick, J Kűng & R Wagner (edd), Lecture Notes in Computer Science 5181, Springer 676-683 (2008). Nelson, D A, Rossiter, N, Stirk, S, & Warrender, R, A Comparison of the Product Model and the Third Manifesto, 8th World Multiconference on Systemics, Cybernetics and Informatics (SCI 2004), July 18-21, Orlando, USA, 301-305 (2004). Aljareh, S, & Rossiter, N, Towards Security in Multi-agency Clinical Information Services, Workshop on Dependability in Healthcare Informatics, Edinburgh University, March 2001 33-41 (2001). Heather, M A, & Rossiter, B N, The Universal Reference Model in Support of Enabling Technologies for Client/Servers, in: 2nd International Seminar on Client-Server Computing, IBM La Hulpe, 18-20 May (1997). Michael Heather &d Nick Rossiter, the Higher Logic of Metaheuristics, HM 2016, 10th International Workshop on Hybrid Metaheuristics, 8-10 June 2016, Plymouth, UK (2016). Heather, M A, & Rossiter, B N, Law, Logic and Language in Legal Computer Science, Law, Philosophy and Computer Science, 1-2 345-365 (1998). This is a revised version of: Rossiter, B N, & Heather, M A, Categorical Models for the Environment, Envirosoft 94, San Francisco, November 1994 (1994). Florida-James, B, Hills, W, Rossiter, B N, Norman, P, & Chao, K-M, An Agent Mechanism for Version Support in Engineering Design, ASME Design Engineering Technical Conference (DETC'98), Atlanta, USA, September 1998 (1998). Reichert, Tim, Klaus, Edmund, Schoch, Wolfgang, Meroth, Ansgar & Herzberg, Dominikus, A Language for Advanced Protocol Analysis in Automotive Networks, Proceedings of the 30th International Conference on Software Engineering, ICSE'08, ACM, New York 593-602 (2008). Reichert, Tim, and Herzberg, Dominikus, A Domain Specific Language for Uncovering Abstract Protocols and Testing Message Scenarios, Proceedings of Software Engineering 2008 (Workshops) 427-430 (2008). Reichert, Tim, and Herzberg, Dominikus, Teaching Language-Driven Software Engineering, International Conference of Education, Research and Innovation (ICERI), Madrid, Spain, November (2009). Herzberg, Dominikus, & Reichert, Tim, Concatenative Programming - An Overlooked Paradigm in Functional Programming, ICSOFT 2009 - Proceedings of the 4th International Conference on Software and Data Technologies, Sofia, Bulgaria, July 26-29, 2009, INSTICC Press 1 257-263 (2009). Herzberg, Dominikus, & Reichert, Tim, Software Engineering for Telecommunication Systems, Benjamin W. Wah et al. (edd. ): Encyclopedia of Computer Science and Engineering, Wiley (2009). Herzberg, Dominikus, Reichert, Tim, & Rossiter, Nick, Towards Modelling Language Interoperability – Getting Meta-Level Architectures Right, Forschungsbericht der Hochschule Heilbronn 2008/2009 (2009). The six papers on language-based software engineering are collected together in this pdf. El Bekai, Ali S, Rossiter, Nick, & Vassilev, Vassil T, Okvir Rada Virtualnih Izložbi: Primjena XML Procesiranja Podataka za Objavljivanje Muzejskog Sadržaja na Webu [Virtual Exhibitions Framework: Utilisation of XML Data Processing for Sharing Museum Content over the Web], Muzeologija 41/42 2004/2005, Zagreb, Croatia, 98-112 (2007). Rossiter, B N, & Heather, M A, Hypertext -- where EP meets IR, in: Proceedings 13th BCS Information Retrieval Colloquium, McEnery, A M, (ed. ), 147-154 (1991). Rossiter, B N, & Heather, M A, Database Models for Textual Documents: User Needs and System Capabilities, in: DEXA'90, Tjoa, A M, & Wagner, R, (edd. ), Vienna 1990, 479-486 (1990). Sillitoe, T J, Rossiter, B N, & Heather, M A, Trail Management in Hypertext: Database Support for Navigation through Textual Complex Objects, in:, BNCOD-8 Proc., Brown, A, & Hitchcock, P, (edd. ), 224-242 (1990). Heather, M A, & Rossiter, B N, Syntactical relations in parallel text, Proceedings 15th International Conference of Association for Literary & Linguistic Computing, Choueka, Y, (ed), Jerusalem 1988, 197-214 (1990). Rossiter, B N, Sillitoe, T J, & Heather, M A, Database Support for Very Large Hypertexts: Data Organization, Navigation and Trails, Electronic Publishing - ODD, 3(3) 141-154 (1990). Heather, M A, & Rossiter, B N, Theoretical Structures for Object-based Text, in: Workshop on Object-Oriented Document Manipulation (Rennes, May 1989), Andre, J, & Bezivin, J, (edd), BIGRE no. 63-64 178-192 (1989). Heather, M A, & Rossiter, B N, A Generalized Database Management Approach to Textual Analysis, in: Proc. 2nd Int. Colloq Bible and Computer: Methods, Tools, Results, Poswick, R-F, (ed), Champion-Slatkine, Paris-Geneva 519-535 (1989). Heather, M A, & Rossiter, B N, Semantic Database Modelling of Documents with Symbolic Addressing, Proceedings Hypertext-II, University of York (June 1989). Heather, M A, & Rossiter, B N, Specialist dictionaries in electronic form, Literary & Linguistic Computing 3(2) 109-121 (1988). Rossiter, B N, & Heather, M A, Data models and legal text, CC AI 5(1) 39-55 (1988). Rossiter, B N, Generalized DBMS as a tool for research, University Computing 10(2) 71-79 (1988). Heather, M A, & Rossiter, B N, The text environment and database management systems, in: Empirical Foundations of Information and Software Science III, Rasmussen, J, & Zunde, P, (edd), Plenum, New York 45-62 (1987). Rossiter, B N, Full text data base management systems: a model and implementation for law, in: Automated Analysis of Legal Texts, Martino, A A, & Socci Natali, F, (edd) North-Holland, Amsterdam 899-916 (1986). April 2007: Methodologies and generic services for developing next generation application software for interoperability, with Daista Software Ltd of Gateshead, nine-months funding starting in September /October 2007, awarded by ONE NorthEast, total value £30,000.